straight toque with tami,eh? : What I get for thinking! 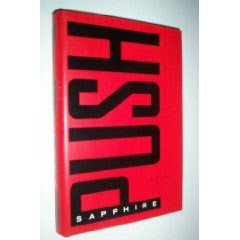 and also read the book Push by Sapphire. These books are complete polar opposites as far as story line. Ella Minnow Pea is a book that is absolutely clean and pure. Push is raw, open, crude, R-rated, and contains profanity...AKA cuss words! So, I'll tell you right now, if you can't handle swears (my favorite euphemism for profanity), don't even bother reading Push. I will not be blamed for your shock. Ella Minnow Pea, takes place in the town of Nollop off the coast of South Carolina. The town is the birth place of Nevin Nollop, the inventor of the pangram "The quick brown fox jumped over the lazy dog". He was a revered citizen who had a monument erected in his honor. The monument contains his famous pangram. The island people pride themselves in their extremely high literacy levels and beautiful use of the English language. As the townspeople move about their business, random letters begin to fall from Nollop's monument. A decree is set by the government officials that citizens can no longer speak or write that letter. If there is an infraction, the guilty person is first warned, second, flogged, and third, banished from the island. As letters continue to drop from the monument, they also drop from the book. (kind of fun to read) The reader witnesses a complete deterioration of a beautiful language. (pg. 5) Sunday, July 23: "How different the world would be today if not for the sentence which the lexically gifted Mr. Nollop issued forth! How we cherish his contribution to the English-speaking world of one short sentence that employs with minimal repetition each of the twenty-six letters of our alphabet!" (pg.188) Wetstae, Nogemger 15: "Insitentallee, ewe are propaplee reating mie last letter to ewe. It is now simplee too tiring to write. To sae watt I most sae in langwage one mae onterstant. I am so sorree"
The only salvation for the island is for someone to come up with another pangram containing less than 32 letters. Then the alphabet will be reinstated and the island can return to the literate place it was before the letters began falling from the monument. 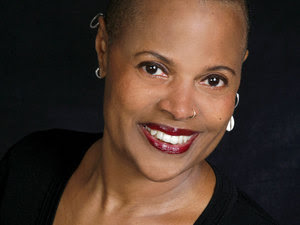 In Push, Precious Jones has been "raised" in Harlem with abusive parents. I was shocked to read what a parent could do to a child. Several times I had to put the book down to keep from sobbing. Precious gives birth to two children...both by her own father. She goes to school until she is 16 and pregnant with her second child (she had her first at 12) where she is expelled from school for being pregnant. She was never a troublemaker in school. She sat. She sat and sat in class and because she never made a fuss, she was overlooked. She didn't even know her ABC'S at 16. She had NO literacy or language other than what her horrendous parents yelled at her when she was home. Upon being expelled from school, Precious is introduced to the program: "Each One Teach One" which is a pre-GED course. Precious joins the program and is able to find assistance with housing and day care. She enters a class that gifts her with language to find her voice. Her teacher, Miss Rain, has the students keep a journal which she responds to in writing each day. "Dr Miz Ms Rain sll yr I sit cls I nevr lrn bt I gt babe agn Babe bi my fvr"
Ms Rain say more now, much more. She wan more from me. More than 15 minutes an she write back. Say walk wif it. The journal? I say. Yeah she say. Walk wif da journl. Everywhere you go, journl go. You know I go walk with Abdul (her son) etc., take journal, write stuff in journal. learnin lot: to too two. three different 2 words. Each one is diffrent. Four for fore. Three four words. Ms Rain tell me to koncentrate on my story. When I can not spell a word Ms Rain tell me sound out firs lettr c____and draw a lin. Thas concentrate. Latrer she will fill in rite spelling for me. But my spelling is impruv. Way way improve." So those are the basic plots of the two books. You are probably thinking...how in the world can they have anything in common? Hang on. In my world, they do. My world is Literacy. Reading. Speaking. Writing. Language Acquisition. It's my job as a first grade teacher to teach children to read and write. It is in my blood. I love it. So, in MY comparison of these novels, I was struck with the notion of the POWER of language whether it be written or spoken or, even, read. If you are still reading this, you have most likely figured out where I'm going with this book comparison. WORDS! The citizens of Nollop BEGAN with words and literacy. They were totally empowered with language. There are beautiful descriptions and conversations in the beginning. Then, throughout the book as they lose letters, their very language is taken from them. As a reader, I could feel the helplessness they felt as the book moved forward. They became "lesser citizens" they turned inward. Push is the opposite. 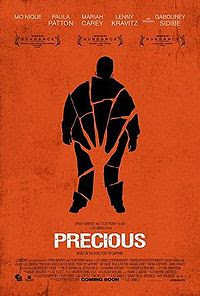 Precious started out helpless. She had no language. She had many, many thoughts and ideas but no outlet for expressing them. As I read the book, I felt the entirely opposite feelings from Ella. As Precious was freed, my mind was freed. Reading her words were difficult in the beginning (even for this experienced reader of first grade spelling)yet, with each page I think I felt a bit like Precious. I was open to her growth. Her power. She gained power as she acquired language and writing. Ella Minnow Pea wraps up nicely with a lovely happy ending. It is considered a "fable" by those who have reviewed the book. The conclusion of Push?...not so much. There is no resolution in the end. But, there is some hope. She was given wings...Ella's were taken away. All because of the written word...LANGUAGE. 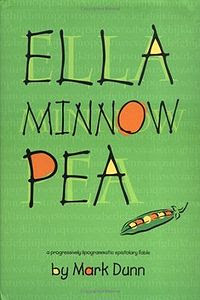 Ella Minnow Pea and Push are the perfect juxtaposation of literacy acquisition. What happens to us with AND without. What happens when we lose it. What happens when we gain it. In a sense, when we lock ourselves out of literacy, we lock ourselves out of life. There, I'm done. I feel better. Thanks to those who stuck with me to the end. If it doesn't make sense, that's okay. It's all straight in my mind...especially since I released it here. Great post, Tami. Very inspiring. You make me want to read more and more and more. Im going to mexico this week and I think I just may take one of these books with me.